Reading and share top 78 famous quotes and sayings about Denounce by famous authors and people. Browse top 78 famous quotes and sayings about Denounce by most favorite authors. 1. "Personally, I want to die in dignity but my passing celebrated jollity. I've told my executors that I want a stand up comedian in the pulpit telling amusing anecdotes, and the coffin to slide into the incinerator to the sound of Marlene Dietrich. If the booze up can begin right away, so much the better, and with a bit of luck the crematorium will never be gloomy again. Anyone mourning should be denounced as the representative of a credit card company and thrown out on their ear. Snowballs if in season (tomatoes if not) can be thrown at anyone uttering even worthy cliches like "the struggle goes on" and should anyone be prepared to dodge pieces of concrete confrontation.If I have miscalculated, as a worthy clerical friend assures me I have, and there really is a God, I'd like to feel if he's got any sense of humor or feeling for humanity there's nobody he would sooner have in heaven than people like me, and if he hasn't, who wants in?" 2. "My love, I have tried with all my beingto grasp a form comparable to thine own,but nothing seems worthy;I know now why Shakespeare could notcompare his love to a summer's day.It would be a crime to denounce the beautyof such a creature as thee,to simply cast away the precisionGod had placed in forging you.Each facet of your beingwhether it physical or spiritualis an ensnarementfrom which there is no release.But I do not wish release.I wish to stay entrapped forever.With you for all eternity.Our hearts, always as one." 3. "There is a huge trapdoor waiting to open under anyone who is critical of so-called 'popular culture' or (to redefine this subject) anyone who is uneasy about the systematic, massified cretinization of the major media. If you denounce the excess coverage, you are yourself adding to the excess. If you show even a slight knowledge of the topic, you betray an interest in something that you wish to denounce as unimportant or irrelevant. Some writers try to have this both ways, by making their columns both 'relevant' and 'contemporary' while still manifesting their self-evident superiority. Thus—I paraphrase only slightly—'Even as we all obsess about Paris Hilton, the people of Darfur continue to die.' A pundit like (say) Bob Herbert would be utterly lost if he could not pull off such an apparently pleasing and brilliant 'irony." 4. "Offered a job as book critic for Time magazine as a young man, Bellow had been interviewed by Chambers and asked to give his opinion about William Wordsworth. Replying perhaps too quickly that Wordsworth had been a Romantic poet, he had been brusquely informed by Chambers that there was no place for him at the magazine. Bellow had often wondered, he told us, what he ought to have said. I suggested that he might have got the job if he'd replied that Wordsworth was a once-revolutionary poet who later became a conservative and was denounced by Browning and others as a turncoat. This seemed to Bellow to be probably right. More interesting was the related question: What if he'd kept that job?" 5. "Hypocrisy versus authenticity among men is not always so black and white, and as is righteousness, humility is often self-proclaimed. The Church is most definitely supposed to be a hospital for the spiritually, emotionally, mentally, and physically sick, hurting, and broken individual, yet ironically, many of its critics are those who ran away and permanently denounced its members after they visited and felt that they were sneezed on." 6. "A failing grade does not denounce a child to fail in life. An IQ is what I would call an 'inadequate question', it may state our brain capacity or tell us how smart we are, but it does not predict our future. Happy Character Traits and positive Reinforcements will help a child succeed better than a number that means nothing"
7. "It's not unpatriotic to denounce an injustice committed on our behalf, perhaps it's the most patriotic thing we can do." 8. "When I had to work Shea Stadium for a Mets-Braves game – Atlanta pitcher John Rocker had recently given an interview in which he denounced New Yorkers of all Colors and preferences – I was assigned to a parking lot, where numerous drivers asked me for directions to various highways. When my first answer – "I have no idea" – seemed to invite denunciation and debate, I revised it to "Take the first left." For all I know, those people are still lost in Queens." 9. "The president is being denounced for not taking the kind of pre-emptive action in Afghanistan that he has been so passionately denounced for taking in Iraq. Damned if he does and damned if he doesn't." 10. "They hate kings, they hate priests, they hate soldiers, they hate sailors. They distrust men of science, they denounce the middle classes, they despair of working men, but they adore humanity. Only they always speak of humanity as if it were a curious foreign nation. They are dividing themselves more and more from men to exalt the strange race of mankind. They are ceasing to be human in the effort to be humane." 11. "But the new rebel is a skeptic, and will not entirely trust anything. He has no loyalty; therefore he can never be really a revolutionist. And the fact that he doubts everything really gets in his way when he wants to denounce anything. For all denunciation implies a moral doctrine of some kind; and the modern revolutionist doubts not only the institution he denounces, but the doctrine by which he denounces it...The modern man in revolt has become practically useless for all purposes of revolt. By rebelling against everything he has lost his right to rebel against anything." 12. "Extremism in defense of liberty is not a vice, but I denounce political extremism, of the left or the right, based on duplicity, falsehood, fear, violence and threats when they endanger liberty." 13. "It is the natural tendency of the ignorant to believe what is not true. In order to overcome that tendency it is not sufficient to exhibit the true; it is also necessary to expose and denounce the false. 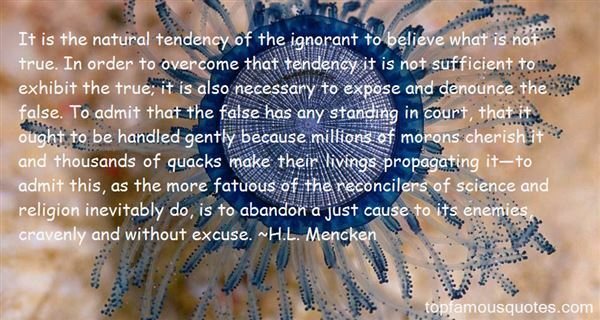 To admit that the false has any standing in court, that it ought to be handled gently because millions of morons cherish it and thousands of quacks make their livings propagating it—to admit this, as the more fatuous of the reconcilers of science and religion inevitably do, is to abandon a just cause to its enemies, cravenly and without excuse." 14. "Of these, only the last, the crime against humanity, was new and unprecedented. Aggressive warfare is at least as old as recorded history, and while it has been denounced as "criminal" many times before, it has never been recognized as such in any formal sense." 15. "The arts of power and its minions are the same in all countries and in all ages. It marks its victim; denounces it; and excites the public odium and the public hatred, to conceal its own abuses and encroachments." 16. "Why of course the people don't want war. Why should some poor slob on a farm want to risk his life in a war when the best he can get out of it is to come back to his farm in one piece? Naturally the common people don't want war neither in Russia, nor in England, nor for that matter in Germany. That is understood. But, after all, it is the leaders of the country who determine the policy and it is always a simple matter to drag the people along, whether it is a democracy, or a fascist dictatorship, or a parliament, or a communist dictatorship.Voice or no voice, the people can always be brought to the bidding of the leaders. That is easy. All you have to do is tell them they are being attacked, and denounce the peacemakers for lack of patriotism and exposing the country to danger. It works the same in any country." 17. "As the war went on, opposition grew. The American Peace Society printed a newspaper, the Advocate of Peace, which published poems, speeches, petitions, sermons against the war, and eyewitness accounts of the degradation of army life and the horrors of battle. The abolitionists, speaking through William Lloyd Garrison's Liberator, denounced the war as one "of aggression, of invasion, of conquest, and rapine—marked by ruffianism, perfidy, and every other feature of national depravity . . . " Considering the strenuous efforts of the nation's leaders to build patriotic support, the amount of open dissent and criticism was remarkable. Antiwar meetings took place in spite of attacks by patriotic mobs." 18. "It was not Christianity which freed the slave: Christianity accepted slavery; Christian ministers defended it; Christian merchants trafficked in human flesh and blood, and drew their profits from the unspeakable horrors of the middle passage. Christian slaveholders treated their slaves as they did the cattle in their fields: they worked them, scourged them, mated them , parted them, and sold them at will. Abolition came with the decline in religious belief, and largely through the efforts of those who were denounced as heretics." 19. "Once, when a religionist denounced me in unmeasured terms, I sent him a card saying, "I am sure you believe that I will go to hell when I die, and that once there I will suffer all the pains and tortures the sadistic ingenuity of your deity can devise and that this torture will continue forever. Isn't that enough for you? Do you have to call me bad names in addition?" 20. "Fallujah was a Guernica with no Picasso. A city of 300,000 was deprived of water, electricity, and food, emptied of most of its inhabitants who ended up parked in camps. Then came the methodical bombing and recapture of the city block by block. When soldiers occupied the hospital, The New York Times managed to justify this act on grounds that the hospital served as an enemy propaganda center by exaggerating the number of casualties. And by the way, just how many casualties were there? Nobody knows, there is no body count for Iraqis. When estimates are published, even by reputable scientific reviews, they are denounced as exaggerated. Finally, the inhabitants were allowed to return to their devastated city, by way of military checkpoints, and start to sift through the rubble, under the watchful eye of soldiers and biometric controls." 21. "But when we make choices that are different than what our friends are doing, it might seem to them that we are questioning their choices - even if it has nothing to do with them.... And what is the sense in feeling guilty about making different choices than our mothers and the other women before us? Our mothers did the best they could with what they had available to them. Our choices, if different from theirs, are not a denouncement of theirs." 22. "Most world religions denounced war as a barbaric waste of human life. We treasured the teachings of these religions so dearly that we frequently had to wage war in order to impose them on other people." 23. "One of the most popular genital surgeries is labia minora reduction. When a similar procedure is performed on healthy girls in some African countries as a coming-of-age rite to control their sexuality, Westerners denounce it as genital mutilation; in the U.S. of A., it's called cosmetic enhancement. But both procedures are based on misogynist notions of female genitalia as ugly, dirty, and shameful. And though American procedures are generally performed under vastly better conditions (with the benefit of, say, anesthesia and antibiotics), the postsurgical results can be similarly horrific, involving loss of sensation, chronic pain, and infection." 24. "Because I have forgiven my past, and God has forgiven my past, no person can make me denounce my past. It made me who I am today, and the choices I make from this moment on are what will ultimately define me." 25. "When last I checked, you were a sorcerer, not a Jedi. ""You've seen Star Wars? ""Seen it and denounced it. ""You've denounced Star Wars? "She looked me straight in the eye and said, "Hollywood should not glorify witches. ""I think you've missed the point...""I also denounce Harry Potter.""Really?""Yes.""Because... ""...because literature, especially children's literature, should not glorify witches. ""Oda, what do you do for fun? "She thought about it, then said, without a jot of humor, "I denounce things." 26. "Literature is that which denounces and slashes apart the repressing machine at the level of the signified." 27. "There is yet another class that, having found that their own religion not only prevents free thinking but that some of its philosophies are also against some basic social, economic and scientific concepts of life as required by the progressive society, comes to the illogical conclusion that all religions similarly thwart the growth of progressive societies... Such people fall easy prey to materialism and denounce all religions without having any definite idea of any religion at all." 28. "Israel cannot afford to stand against the entire world and be denounced as the aggressor." 29. 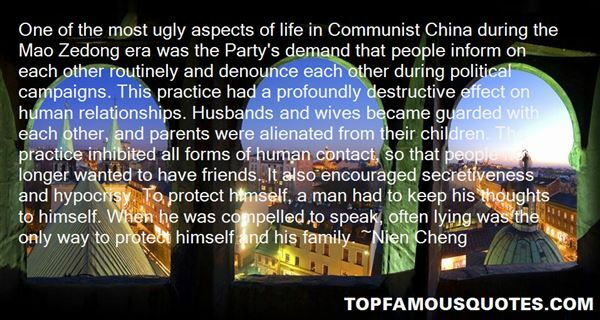 "One of the most ugly aspects of life in Communist China during the Mao Zedong era was the Party's demand that people inform on each other routinely and denounce each other during political campaigns. This practice had a profoundly destructive effect on human relationships. Husbands and wives became guarded with each other, and parents were alienated from their children. The practice inhibited all forms of human contact, so that people no longer wanted to have friends. It also encouraged secretiveness and hypocrisy. To protect himself, a man had to keep his thoughts to himself. When he was compelled to speak, often lying was the only way to protect himself and his family." 30. "For so many years, the official propaganda machinery had denounced humanitarianism as sentimental trash and advocated human relations based entirely on class allegiance. But my personal experience had shown me that most of the Chinese people remained kind, sensitive, and compassionate even though the cruel reality of the system under which they had to live compelled them to lie and pretend. Pg. 409"
31. "What the Acropolis in Athens looked like, including the Parthenon of the gods, is best told today at the British Museum in London, which houses the marble statuary removed by Lord Elgin, the British ambassador to Constantinople in 1801-05, and sold at a knockdown price (only 23 million dollars in our money) to the British Museum a couple of decades later. Although Elgin had or bought the permission of the Turkish sultan then ruling Greece, some contemporaries, including the poet and pro-Greek activist Lord Byron, already denounced the Elgin Marbles as 'pillage.' So the Greek government has claimed since the 1970s, but the British won't return them." 32. "On various occasions, especially in trying to think of western American history in the context of the worldwide history of colonialism, it has struck me that much of the mental behavior that we sometimes denounce as ethnocentrism and cultural insensitivity actually derives less from our indifference or hostility than from our clumsiness and awkwardness when we leave the comfort of the English language behind... [V]enturing outside the bounds of the English language exercises and stretches our minds in ways that are essential for getting as close as we can to the act of seeing the world from what would otherwise remain unfamiliar and alien perspectives." 33. "Regarding comments attributed to me in the Los Angeles Times - allegedly made on a bus trip from Germany to Holland in 1998 - I emphatically denounce such comments as false." 34. "No society has succeeded in abolishing the distinction between ruler and ruled... to be a ruler gives one special status and, usually, special privileges. During the Communist era, important officials in the Soviet Union had access to special shops selling delicacies unavailable to ordinary citizens; before China allowed capitalist enterprises in its economy, travelling by car was a luxury limited to tourists and those high in the party hierarchy Throughout the 'communist' nations, the abolition of the old ruling class was followed by the rise of a new class of party bosses and well-placed bureaucrats, whose behaviour and life-style came more and more to resemble that of their much-denounced predecessors. In the end, nobody believed in the system any more. That, couple with its inability to match the productivity of the less bureaucratically controlled, more egoistically driven capitalist economies, led to its downfall." 35. "Only one thing to it: a strong stomach. The guts to gladhand a man you're going to stab in the back; pledge allegiance to principles you stomp on every day; righteously denounce some despot in the press and sell him arms under the table. The talent to whip up the voters' worst passions while you seem to call on their highest instincts, and the sense to stay wrapped in the flag. That's politics: I'll take the simple life." 36. "As the nation divided into Federalists and Republicans, each group called the other the worst name possible: "party". Most Americans feared the idea of party; believing that a society should unite to achieve the public good, they denounced parties as groups of ambitious men selfishly competing for power. Worse, parties were danger signals for a republic; if parties dominated a republic's politics, its days were numbered." 37. "The Tax Code today is more complicated than ever, and the very people on the Republican side who denounce the Tax Code's complexity are the ones that put together what they now call a convoluted monstrosity. They put it into effect." 38. "Before the war is ended, the war party assumes the divine right to denounce and silence all opposition to war as unpatriotic and cowardly." 39. "That new technologies and techniques would be forthcoming was a fundamental article of Christian faith. Hence, no bishops or theologians denounced clocks or sailing ships--although both were condemned on religious grounds in various non-Western societies." 40. "That image of a chessboard — an epic contest between two giant players, carefully nudging their pieces around the globe as part of a grand strategy — has indeed become a familiar metaphor for the Cold War. But it is misleading. Many decisions remembered today for their farsighted, tactical brilliance were denounced in their day as weak-willed. And big, public gestures often made less difference than the small, hidden ones." 41. "History is made up of "moral" judgments based on politics. We condemned Lenin's acceptance of money from the Germans in 1917 but were discreetly silent while our Colonel William B. Thompson in the same year contributed a million dollars to the anti-Bolsheviks in Russia. As allies of the Soviets in World War II we praised and cheered communist guerrilla tactics when the Russians used them against the Nazis during the Nazi invasion of the Soviet Union; we denounce the same tactics when they are used by communist forces in different parts of the world against us. The opposition's means, used against us, are always immoral and our means are always ethical and rooted in the highest of human values." 42. "I came to poetry through the urgent need to denounce injustice, exploitation, humiliation. I know that's not enough to change the world. But to remain silent would have been a kind of intolerable complicity." 43. "Literature of escape," Ray Bradbury's work is sometimes called with a sneer. But then, as Tolkien once observed, who other than jailers are fearfully preoccupied with escape? Kirk wrote that the ideologue, in particular, denounces "escape" because he is a prisoner of his own political obsessions, and misery loves company." 44. "We are here among you as seekers of refuge from our present-your future-a time of worldwide famine, exhausted fuel supplies, terminal poverty-the end of the capitalistic experiment. Once we came to understand the simpl...truth that earth's resources were limited, in fact soon to run out, the whole capitalistic illusion fell to pieces. Those of us who spoke this truth were denounced as heretics, as enemies of the prevailing economic faith. Like religious Dissenters of an earlier day..."
45. "Which is why Slothrop now observes his coalition with hopes for success and hopes for disaster about equally high (and no, that doesn't cancel out to apathy—it makes a loud dissonance that dovetails inside you sharp as knives). It does annoy him that he can be so divided, so perfectly unable to come down on one side or another. Those whom the old Puritan sermons denounced as "the glozing neuters of the world" have no easy road to haul down, Wear-the-Pantsers, just cause you can't see it doesn't mean it's not there! Energy inside is just as real, just as binding and inescapable, as energy that shows. When's the last time you felt intensely lukewarm? eh? Glozing neuters are just as human as heroes and villains. In many ways they have the most grief to put up with, don't they?" 46. "...What pleases us in those who are rising is less pleasing in those who are falling. We do not admire the combat when there is no danger; and in any case, the combatants of the first hour alone have the right to be the exterminators in the last. He who has not been a determined accuser during prosperity should hold his peace in adversity. He alone who denounces the success has a right to proclaim the justice of the downfall." 47. "In this nineteenth century, the religious idea is undergoing a crisis. People are unlearning certain things, and they do well, provided that, while unlearning them they learn this: There is no vacuum in the human heart. Certain demolitions take place, and it is well that they do, but on condition that they are followed by reconstructions.In the meantime, let us study things which are no more. It is necessary to know them, if only for the purpose of avoiding them. The counterfeits of the past assume false names, and gladly call themselves the future. This spectre, this past, is given to falsifying its own passport. Let us inform ourselves of the trap. Let us be on our guard. The past has a visage, superstition, and a mask, hypocrisy. Let us denounce the visage and let us tear off the mask." 48. "Denounce me for advocating freedom if you can, and I will bear your curse with a better resignation." 49. "He seemed to be buffeted from both sides, challenged by his dreams, which revolted at the compromises of reality, and assaulted by reality which denounced the emptiness of all dreams. He seemed to spend himself in that struggle - the severest that a man can face; and he seemed to win by a constant renewal of effort in which he refused to sink either into placid acceptance of the world, or into self-contained satisfaction with his vision." 50. "Perhaps the sallow drunk should have taken the hint. But he needed to feel confident in his life. It was only when he drank that he felt he could be anything. He felt this precisely because his perceptions had grown so constricted that he could no longer be cognizant of his limitations, like those old people who when sight, hearing and memory slip away make unflattering remarks in loud voices about others who are still present but out of their dwindling sensory range. How amazed they'd be, if they understood that the nasty man who'd long since vanished from their apprehension like last Thursday's television show had just now heard them denounce his nastiness! For they'd meant no harm! Backstab gossip doesn't harm anybody, does it? It's only steam-letting, social sport, wit, liveliness, self-comfort like complaining over an arthritic wrist." Was it fair to say I didn't know the full state of my soul?"